Lipid oxidation in food systems is one of the most important factors which affect food quality, nutrition, safety, color and consumers’ acceptance. The control of lipid oxidation remains an ongoing challenge as most foods constitute very complex matrices. Lipids are mostly incorporated as emulsions, and chemical reactions occur at various interfaces throughout the food matrix. Recently, incorporation of healthy lipids into food systems to deliver the desired nutrients is becoming more popular in the food industry. Many food ingredients contain a vast array of components, many of them unknown or constituting diverse or undefined molecular structures making the need in the food industry to develop effective approaches to mitigate lipid oxidation in food systems. 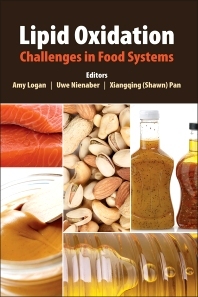 This book provides recent perspectives aimed at a better understanding of lipid oxidation mechanisms and strategies to improve the oxidative stability of food systems. Chapter 1: Challenges in Elucidating Lipid Oxidation Mechanisms: When, Where, and How Do Products Arise? Chapter 2: Challenges in Analyzing Lipid Oxidation: Are One Product and One Sample Concentration Enough? How Does Hydrophobicity Impact Antioxidant Capacity? Amy Logan (nee Richards) has over 10 years of experience as a lipid chemist, and is currently working as a research scientist within CSIRO Animal, Food and Health Sciences in Werribee, Australia. With a Ph.D. from the University of Melbourne (School of Agriculture and Food Systems), Amy has worked alongside the Australian Canola Industry studying the effect of genotype and environment on chemical composition and the influence of oxidative stability within Brassica oils. This research was the basis of her 2006 AOCS Honored Student Award. Her current interests include emulsion/colloidal science, lipid oxidative stability, and structure-function relationships within food matrices. She is currently involved in studies concerning the functional properties of dairy products based on the composition and architecture of the milkfat globule. Awarded with a 2008 Victorian Fellowship and a recipient of the 2010–2011 Australian Academy of Science “Scientific Visits to North America” program, she is an active member of the AOCS including roles within both the Australasian Section and the Lipid Oxidation and Quality division. Uwe Nienaber is an Associate Principal Scientist in the Analytical Sciences Department at Kraft Foods in Glenview, Illinois, where he is currently leading the Physical Sciences group. He earned both M.S. and Ph.D. degrees in Food Chemistry from the University of Münster in Germany. His main interests are in the areas of analytical testing, lipid oxidation, water relations in foods and shelf life. Prior to joining Kraft Foods in 2001, he was a Research Associate at the Food Science and Technology Department at Ohio State University, conducting research on high-­pressure processing of foods. From 1994 to 1997 he worked as R&D Manager at Nutrifood Indonesia with responsibilities for product development and analytical testing. He has been a member of the American Oil Chemists’ Society since 2008. He is also a professional member of IFT since 1997 and has served the Chicago Section as treasurer and chair. Xiangqing (Shawn) Pan is a research scientist at DuPont Nutrition and Health (formally Solae, LLC), and his research interests are in the areas of analytical sciences, lipid oxidation and antioxidants, phospholipids, protein and carbohydrate chemistry. Shawn earned his Ph.D. in the area of Food Chemistry with focus on seafood lipid oxidation and antioxidants from Tokyo University of Marine Science and Technology at Japan, where his study was financially supported by Japanese Government (Monbukagakusho), and his graduate program research in Japan was the basis of his 2005 AOCS Honored Student Award. Prior to joining Solae, LLC, Shawn was a postdoctoral research associate from 2005 to 2007 at Donald Danforth Plant Science Center/University of Missouri-St. Louis in the area of plant biochemistry with focus on lipid metabolomics, lipidomics and proteomics. Shawn has 25 publications in the prestigious journals of the field such as Nature Protocols, Plant Cell, Plant Journal, and Phytochemistry. As an active AOCS member, Shawn actively involved in AOCS LOQ division activities during last five years. He is an active LOQ extended committee member since 2008 and served in different roles in LOQ division such as LOQ Frankel Best Paper Award Committee Chair, Best Student Poster Award Committee Chair and AOCS Honored Student Award Committee Chair as well as AOCS Young Scientist Award Committee member. Shawn also served as AOCS Annual Meeting Technique program Session Chairs since 2010.